Trump has no good reason to scrap the Iran nuclear deal. The reasons his administration has put forth are dishonest and will make us less secure. 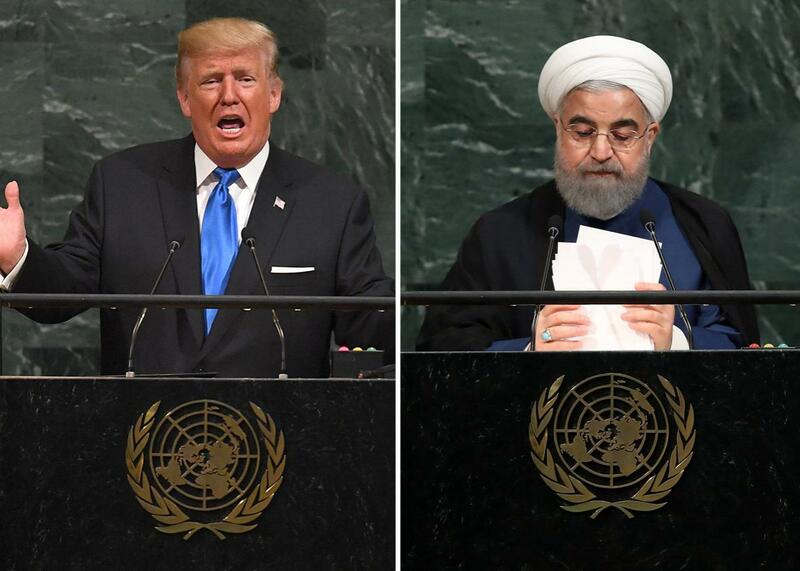 U.S. President Donald Trump and Iranian President Hassan Rouhani at the U.N. Photos by Timothy A. Clary/AFP/Getty Images and Drew Angerer/Getty Images. President Trump seems determined to wiggle out of the Iran nuclear deal, but all the rationales that he and his top aides have put forth to justify the move are specious and self-destructive. The main thing about the deal—which was signed in 2015 by the United States, Britain, France, Russia, China, and Germany, as well as Iran—is that it really did cut off all of Iran’s possible paths to a nuclear weapon, at least for the duration of the agreement and as long as Iran doesn’t cheat. Not even the deal’s critics contest this point any longer, except possibly Trump himself, who in his U.N. address on Tuesday called it the worst, most one-sided transaction in our history. He’s filed the charge many times: Iran got billions of dollars, and we got nothing. He persists in ignoring that the billions Iran received were in fact their own assets, which had been frozen as punishment for their illegal nuclear program; with that program dismantled, the freeze is lifted. That’s how sanctions work, and it’s how the Iran nuclear deal was done. As for the U.S. getting nothing: Preventing the rise of a nuclear-armed Iran, with its heightened possibilities of war, is, I think anyone else would agree, far from nothing. Compliance is an urgent issue, because after the deal was signed the Senate passed a bill demanding that every 90 days the president must certify whether Iran is abiding by its terms. If Iran were cheating, Congress could vote to reimpose sanctions. The bill’s Republican sponsors figured that, at some point, Iran would cheat and that this requirement would put the president—either Obama or his successor, then widely assumed to be Hillary Clinton—on the spot. The problem, from the Republicans’ point of view, is that the International Atomic Energy Agency—which the deal gave extensive rights to inspect Iran’s facilities—has concluded repeatedly that the Iranians are in compliance. Trump has threatened to decertify its compliance anyway. He almost did so in July, the most recent time he had to sign (or not sign) a statement, until his aides convinced him that he couldn’t simply say that day was night. Secretary of State Rex Tillerson, also at the U.N., came up with another reason for scotching the deal. Yes, he conceded, Iran “is in technical compliance with the agreement,” but—as the New York Times paraphrased his words—it is “violating the larger aspirations of the deal by engaging in destabilizing activities not directly covered by it,” such as funding terrorists and developing ballistic missiles. This is shamefully dishonest. The Iran nuclear deal was a carefully worded deal; it is what it says it is, and nothing more. Neither directly, indirectly, nor in any other way does it cover, or aspire to cover, anything beyond Iran’s nuclear program—any more than the decades of nuclear arms-control treaties with the Soviet Union were meant to cover Moscow’s communist ideology, suppression of human rights, or occupation of Eastern Europe. Nor did Moscow suffer the illusion that they might have some impact on America’s bombing of North Vietnam or its entente with rival China. President Obama said repeatedly that he hoped the deal would strengthen the moderate factions in Tehran, paving the way to political reform and more harmonious relations with the West. But he stressed that the deal was in our interests even if wider relations didn’t improve—in fact, if relations remained dismal, the deal would be more vital. Iran’s ballistic missile program is another worry that makes the nuclear deal more, not less, attractive. This was a contentious issue during much of the negotiations. In the end, the United States and the other powers in the talks agreed to let it drop for two reasons. First, unlike Iran’s nuclear program, which was outlawed by the Non-Proliferation Treaty and some U.N. Security Council resolutions, there was nothing illegal about the missile tests. Second, the missiles were viewed as a threat only if they carried nuclear weapons; if the deal halts the nuclear program, the missiles wouldn’t be a threat—at least not in any way that this agreement encompassed. Besides, sanctions against Iran for these specific activities—supporting terrorism and developing ballistic missiles—are still in place; they were not affected by the lifting of sanctions related to its nuclear program. It is not the case that we are letting the Iranians off easy on those counts. A few notions here are mistaken. First, without the deal, Iran could have built some nuclear bombs in one year, not in 10 years. Second, only a few aspects of the deal have 10-year limits—the production of advanced centrifuges, monitoring of Iranian civil nuclear procurement, the automatic U.N. “snapback” of sanctions if Iran cheats. But many other critical aspects of the deal expire in 15 years. These include the 3.67 percent cap on enriched uranium (far below what’s necessary for bomb-grade material), the stockpile cap on even that level of “low”-enriched uranium (which means that, even if they enriched it to weapons-grade levels, they wouldn’t have enough to turn it into a bomb), and the ban on heavy-water reactors (which would be needed to turn enriched uranium into a bomb). The IAEA is allowed to continue inspecting centrifuge production for 25 years. And critical pledges that Iran made in the agreement—to abide by other sorts of IAEA inspections, to reprocess spent fuel (rather than turn it into weapons), and to continue abiding by the Non-Proliferation Treaty—have no expiration date at all. Given all of the above, neither Iran nor any of the deal’s other signatories will see the need to open it up for renegotiation (many who were involved in the monthslong process agree that it was the best deal that could be had), much less scuttle it altogether. One intriguing proposal, made by some, is to start negotiations toward a supplemental agreement without tearing up the original. This idea has precedent. The 1974 Vladivostok Accord stiffened the limits on offensive nuclear weapons that had been set in the 1972 Strategic Arms Limitation Treaty. The 1997 Additional Protocol added inspection procedures to the 1968 Non-Proliferation Treaty. It might not be a bad idea for the six powers and Iran to sit down for talks on improving the deal. One product of the agreement was a permanent “joint commission” to discuss compliance issues, which could be the forum for extended talks. But if anyone is to take the idea of new talks seriously, President Trump needs to accept the existence—and widespread acceptance—of the deal as it stands. This means not only stopping talk of scuttling it for no good reason; it also means doing more to abide by the deal himself. The EU and its Member States and the United States, consistent with their respective laws, will refrain from any policy specifically intended to directly and adversely affect the normalization of trade and economic relations with Iran inconsistent with the commitments not to undermine the successful implementation of the JCPOA. Trump’s persistent threats to pull out of the nuclear deal are also impeding “trade and economic relations,” especially among American banks, which hesitate to get involved with Iranian businesses, lest the resumption of sanctions force them to close the loans or investments they’ve made, losing them money. New York banks and investment funds have almost no relations with any entities in Iran. It would be hard to make a case that, by threatening to pull out of the deal, Trump has “intended” to set back the normalization of trade and economic relations—but the effect does “undermine the successful implementation” of the deal. Iran has its own house to clean in this regard. During the decade when nuclear sanctions were in place, Iranian banks became routers for money laundering—it was the only way to stay in business—and the managers built up habits that they haven’t managed to kick in the two years since the sanctions were lifted. If the United States were serious about normalizing relations, it would offer to send over specialists to help the Iranian banks adjust to global standards and practices. That isn’t happening either. Meanwhile, European banks—trading in euros, not dollars—are making more of a go at working out terms. In any case, scuttling the deal—a nonstarter to begin with—is no way to build trust. More to the point, even if Trump isn’t interested in building trust, it would also severely damage U.S. security interests.